Let me share a moment of honesty with you, friends. For most of my life, I’ve hated pants. Not in the “who needs clothes, I just want to wear pajamas every day” way… in the “I absolutely hate the look of my legs in every single pair I try on” way. I feel so silly even confessing that, but given my short height (5’2″) I’ve always felt that the long, lean leg look was forever out of my grasp. Shopping for jeans? A nightmare. Forget about any other style of pant on the market! It seemed everything I tried on was always way too long, too tight around the thighs and awkwardly bunchy around the ankles. So, putting in the hard work of finding a single go-to pair of jeans has been my fall and winter strategy for as long as I can remember, and trust me, it has gotten so old. But then I found the Sloan pant from Banana Republic, and if there was ever a time for a mid-post drumroll, it’s now! I don’t even know where to start, because I love these things so much, and trust me, that’s the last thing I expected! Let me start out by saying this: When Banana Republic approached me about spreading the word for the Sloan, I nearly said no. That’s how afraid I was. But after some good old-fashioned google image searching, I started seeing that this pant looked good on everyone – petite to tall and everyone in between! Things started looking up even more when I discovered that the Sloan comes in petites, so I pulled the trigger. When I tried them on for the first time, my jaw literally hit the ground. No, I didn’t hate them… I didn’t even like them. I loved them! The fit, the length, the incredibly comfortable stretch, and most importantly, the look! After years of avoiding pants at all cost, I finally found a pair I adored, and I couldn’t believe it. So today, I am so excited to introduce the pair of pants that changed it all for me… the Sloan! Like I mentioned above, these have a fabulous stretch in them. 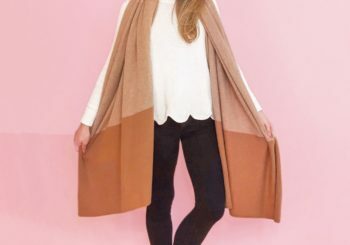 (I can even sit criss-cross applesauce in them… not that I tried or anything…) And while being extremely comfortable, the lower-rise and slimming, tailored leg look incredibly polished and elegant, adding a completely new dimension to my wardrobe. I styled them for summer with an easy striped tee, but love that they look just as fabulous in fall and winter paired with a great layering piece. 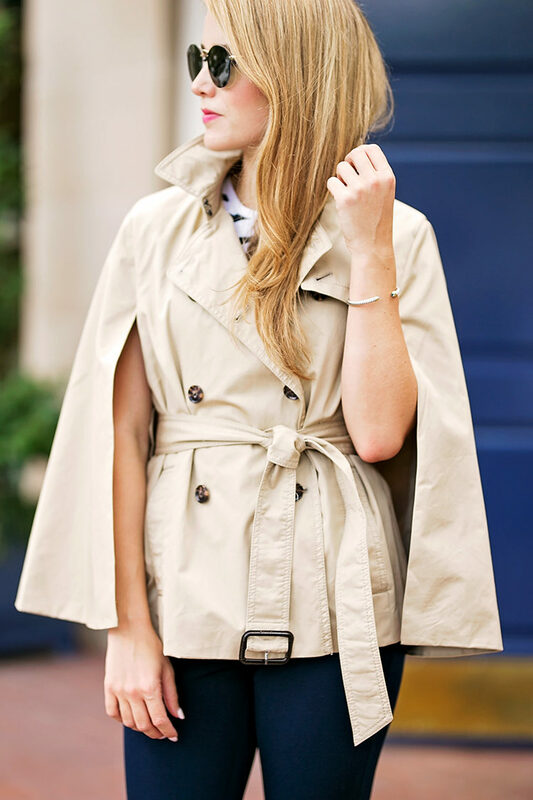 (How fabulous is this trench cape?) As fun as they are to wear with a sassy pair of heels, they also look amazing with a classic loafer, a sweet ballet flat, and even a pair of riding boots! For all my working ladies out there, I have a feeling these are going to become your favorite year-round pant! If nothing else, I hope this funny little story of me finding a pair of pants I love encourages you to try something you’ve been afraid of today! Whether it’s a new style, a new hobby, a new hairdo, or initiating a new friendship, step into it confidently and have fun with it! You just might be surprised at the result! Oh, and go grab the Sloan in every color. That’s what I’m doing after I finish typing out this post. Fit Information: I an 5’2″ and wear a 25 in jeans. I found the 0 petite to fit perfectly! Thank you, Banana Republic, for sponsoring this post! I’m 5’2 as well and pants are a nightmare! Especially slack style pants for work. These look so good on you. I’ll have to try them out! I would love to see you model these in different colors and outfits. Yay thanks for sharing! I actually ordered these last week and im still waiting for them to come. Im the exact same size as you so im hoping they look just as good on me as they do you! Super cute look! Glad you finally found a pair you like :) But as an FYI for gals who wear pants to work every day, I’ve purchased a few pairs of the “Sloan” from BP and they without fail always stretch out by the end of the day… I’m talking baggy rears, knees, and waistlines by lunch time! I’m a big fan of th Sloan fit pants too–I think I own 3 pairs now! I’m always eager to see what colors they offer each season. Aren’t they the best!? I actually wore them to work today. I work with kids and they don’t seem to be stretched out by the end of the day, which is so rare to find! So glad they worked out for you too. Love your blog, keep crushing the blog world! These look amazing and you look so pretty in these photos! Loved the post. In different ways, I totally relate to you about hating how most pants fit! I’ll have to give these a try. Have a great week! Those look really nice! I’m also really loving those heels!